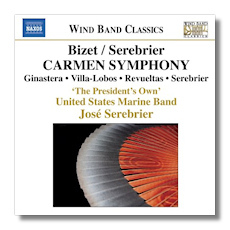 This is an unusual recording: the repertory suggests Latin- or Spanish-flavored music, while the performing ensemble is an American wind band (the United States Marine Band, no less) led by conductor, José Serebrier, who is generally associated with orchestral performances. Serebrier is also a composer in his own right and on this disc is represented by his work Night Cry and two arrangements: the Carmen Symphony (drawn from orchestral interludes and other famous numbers from the opera) and the Revueltas Mexican Dance (based on music from Revueltas' film score for Redes). The other pieces here are the Ginastera Estancia Suite (drawn from the composer's ballet Estancia) and the Villa-Lôbos Concerto Grosso. The Carmen Symphony and Ginastera Estancia Suite are further transformed here, since they were originally conceived for orchestra. The wind band transcriptions for this pair were done by Msgt. Donald Patterson. The Carmen Symphony was fashioned by Serebrier to follow the action in the opera chronologically, unlike the two famous orchestral suites drawn from Bizet's classic. The music is imaginatively conceived and works quite well here. While this is the marquee item on this CD, it is the Ginastera and Villa-Lôbos works that are of the greatest interest, as far as I'm concerned. The Ginastera is colorful, with more than a hint of Stravinsky here and there, and with a wild, rhythmically-charged ending that's sure to get your adrenaline flowing. The Villa-Lôbos, with its mostly chipper demeanor and cosmopolitan character, is colorful and brilliantly scored, once again with the voice of Stravinsky evident. Night Cry is the most modern-sounding work and doesn't quite catch the ear with its dark, slow character and gloomy atmosphere. The concluding piece The Stars and Stripes Forever is a Sousa favorite, of course, and on the night of this concert drew quite enthusiastic reaction from the audience, deservedly so. Everything here is well played by the Marine Band and its numerous talented soloists, especially the Ginastera and Villa-Lôbos works. The sound is vivid and powerful. Strongly recommended!